It is made from oxidizing the thinnest layer of graphite. Graphite consists of millions of ultra-thin layers of graphene. A strong oxidizing agent is used to convert graphite into graphite oxide. Because of that, the graphite material expands significantly. This results, in turn, helps to separate the individual layers. Further, graphite oxide is exfoliated in water using an advanced sonication process. It helps to produce single or fewer layers-thick graphene, which is known as graphene-oxide. The material developed through this intensive process provides a layer of graphene. This layer is 2 dimensional and only 1 atom-thick. 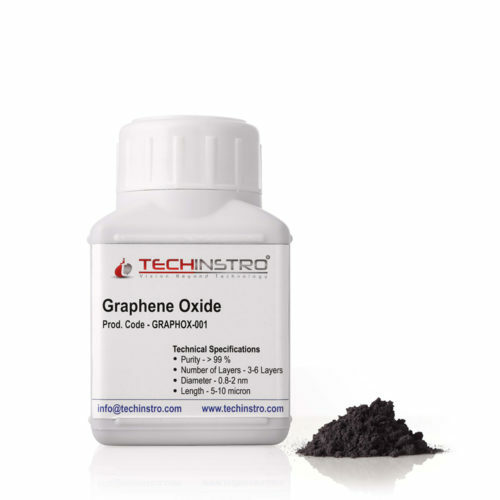 The graphene-oxide is comparatively thinner than conventional graphite or graphite oxide material. The functionalization like epoxide, carbonyl, carboxyl and hydroxyl groups is needed to change the properties of graphene-oxide to use in the various applications. It is commercially available in a nano-powder and dispersed form. It can also utilize as a film on a substrate. Generally, it readily dispersed in water and other organic solvents due to the strong attached oxygen group. It is also soluble in a polymer matrix and fluorescent in nature. It is used in the production of the transparent conductive film, flexible electronics, and biosensors. It is also used to make pure Graphene by the active chemical reduction. This method is one of the cheapest and most efficient processes. It is partially reduced to form reduced graphene-oxide (rGO), where most of the oxygen group has removed. There are numerous promising applications of commercial and research grade graphene-oxide. It is used extensively in R&D laboratories, as well as in various industries, due to its immensely useful properties. The graphene-oxide is an electrically non-conductive due to its disruptive SP2 bonding network; Whereas it can transform into conductive by reducing and restoring “π”-network. Commercial graphene-oxide, structurally, has 3 strong electron bonds and 1 loose bond with a weak connection. These together form a collective electron pool.